These American soldiers probably got ambushed by German machine guns when they were attempting a routine street crossing at the wrong time. They’re at a crossroads, a good spot to ambush an advancing army. This photo is taken during the early hours of the Battle of the Bulge, 1944. Pen marks indicate things Army censors redacted after the film was captured. The censorship shown on the photo was just an initial note that publishers would more thoroughly take out. They didn’t want people to be able to identify where the picture was taken. That’s why they were crossing out only the things that would identify the spot, even religious markings (the crucifix in the corner of the image). It was likely the result of routine censorship. For the Battle of the Bulge, the best units and equipment of the German military were concentrated for the push to the West. The battle was a last ditch attempt by Hitler to split the Allies in two in their drive towards Germany and destroy their ability to supply themselves. This was Germany’s last substantial mobile reserve, and it ended up detracting from Germany’s ability to defend against the Soviet winter offensives beginning in January 1945. The picture is an indicator that the German supply line must have been breaking down for them to be pulling boots off the dead. Also it’s not a good sign when an “advancing” army has to stop and steal shoes. The soldiers most likely did not have boots in very good condition, especially at this point in the war. By that time (late 1944), German boots were poor. They no longer issued “jack boots” but had introduced ankle high ones made from inferior materials. While the Americans had rubber soled, higher quality leather ones. During and after the Battle of the Bulge, German prisoners caught with American equipment on their person were usually shot out of hand. Pictures like this probably encouraged the American response. Read Gus Sajer's "Forgotten Soldier" (if you haven't already) to get a good idea of chronic "supply line issues" characteristic on the Eastern Front, even for an elite division like the Panzer-Grenadier-Division Großdeutschland. My family comes from around that area, I've been to Büllingen, as it reads on the sign, many times. Both my grandfathers were forced to fight for the Germans in WW2 and my mother's maternal grandfather and his son were sent to a concentration camp because they had listened to English radio and both died. As a Lithuanian, I can tell exactly the same stories about Russians. I found this spot on google earth. Long: 6.278790° You can still see the horse trough there in the street view. "During and after the Battle of the Bulge, German prisoners caught with American equipment on their person were usually shot out of hand." I think they were shot more as a response to the Malmedy Massacre than because they had captured American equipment in their possession. 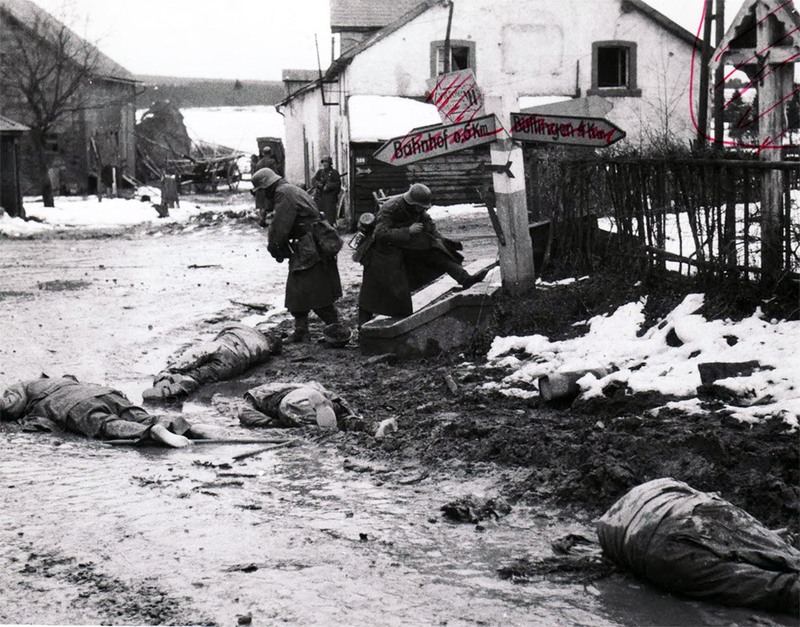 These American soldiers were captured, and then executed by the Germans at this crossroads. The dead Americans were then stripped of their clothes and boots.